The Crest Trail is actually a system of trails, spurs and side loops that sits like an inverted letter "Y" on the central ridge of the Chiricahuas. To make the job of describing this trail network a bit more manageable, the FS has broken it up into three parts. This page is for the trail from the northern boundary of the Chiricahua Wilderness to the foot of the upside down Y's southwestern leg on Monte Vista Peak. About 2.5 miles from the Wilderness boundary, the trail reaches Junction Saddle. 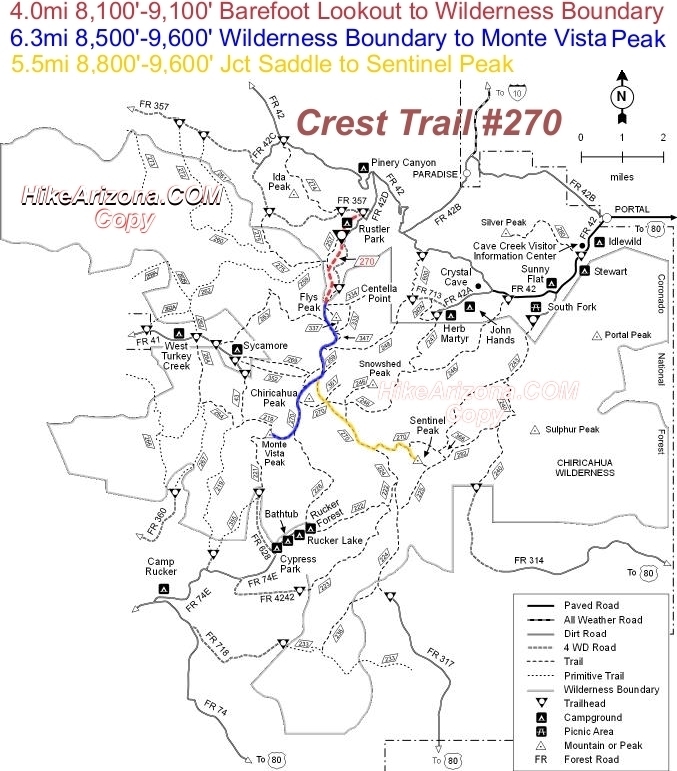 This southeast fork of the Crest Trail #270 goes to Sentinel Peak. Between the Wilderness boundary and Monte Vista Peak, the Crest Trail offers access to a land of diverse forests, wildflower clad meadows, soaring overlooks and some of the highest summits in the mountain range. Particular features accessible along this section of the Crest include Flys Peak, Anita Park, Chiricahua Peak and the unmatched views of Monte Vista Peak. Centella Point, Winn Falls, Anita Spring and Booger Spring are accessible via spurs or connecting trails. Another aspect of this trail is its pleasant character. Much of it wanders along a wide and easy to follow trail, cushioned with pine needles and shaded by tall trees. The gradient is moderate, and grassy parks and distant vistas appear with pleasing frequency. Even the wildlife seems cooperative. It's a good place to see Coues white-tailed deer, a variety of songbirds and the retreating shadow of a shy black bear. Numerous side trails provide plenty of opportunity for added adventure.